VaShadow jumped in and pushed the laser engraver project ahead and now it's near completion. When we left off, Vex had completed the embedded controller that handles the pulse width modulation of the CO2 laser. Thanks to VaShadow, the engraver is now nearly encased in a box setup to keep the work area clear and push any bad smells out of the lab. TJ cut the metal that lines the inside of the box around the laser bounce area. The box is adapted from the original Meistergram layout and includes some needed adjustments. 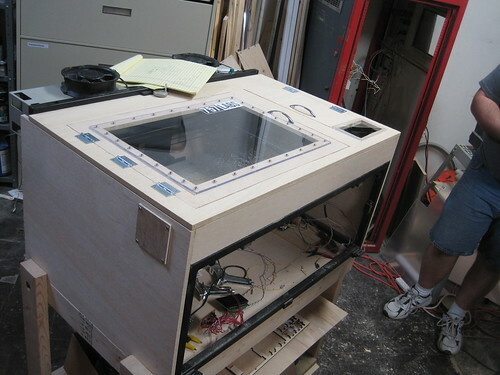 Chances are it will be running again today, only this time with a nice safe enclosure! Many thanks to VaShadow for helping on this! That looks pretty fancy! Good job guys!